Home / The Social Media Rocket Blog / How to get back the number of fans who have hidden you from their news feed ? Dear friends, it’s been a while. 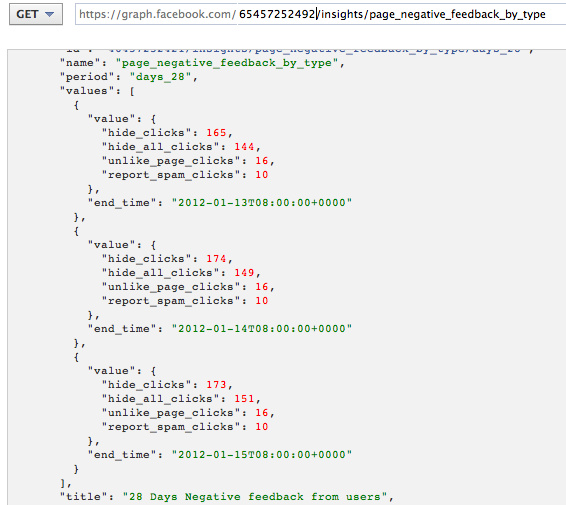 Some people have been complaining of the recent removal of the “Unsubscribes” metric from Facebook’ brand new Insights. That’s right they’re nowhere to be found. Even in the Excel extract. Don’t worry, we have a solution for you. It takes a bit of time, but it’s really easy. Just follow these 4 steps. First, you need to get the Facebook id of the page you want to retrieve the data for. To get it, go to your page. Then, change “www” into “graph”. And here you have your id, on the very first line. Copy it. Click on the “Get Access Token” button. Verify that “read_insights” is selected on the third tab. Click on “Get Access Token”. Click on “Submit” to get the unsubscribes for one day, 7 days and 28 days periods. Hope you’ll find this trick useful. Please, leave a comment below to let me know. hi, this is very useful thank you .not sure though whether one is to total those three groupings of figures within the 28 day period? Great post; with my very limited abilities, was able to follow all the steps. However, I wasn’t able to retrieve the correct access token or the data because api explorer insisted that I had to use facebook as Linda Lando vs. Miss Lando’s Math Tutoring.